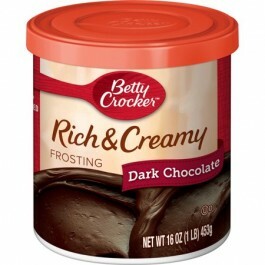 Met de Betty Crocker Dark Chocolate Frosting kun je al jouw gebak versieren met chocoladeglazuur die heerlijk vol en romig is. Smaakt geweldig op citroentaart, cupcakes, chocolade laagjestaart en brownies. Sugar, Water, Palm Oil, Cocoa Processed with Alkali, Corn Starch, High Maltose Corn Syrup, Canola Oil, Contains 2% or Less of: Salt, Distilled Monoglcerides, Polysorbate 60, Citric Acid, Sodium Stearoyl, Lactylate, Sodium Acid Pyrophosphate, Artificial Flavor, Freshness Preserved by Potassium Sorbate.